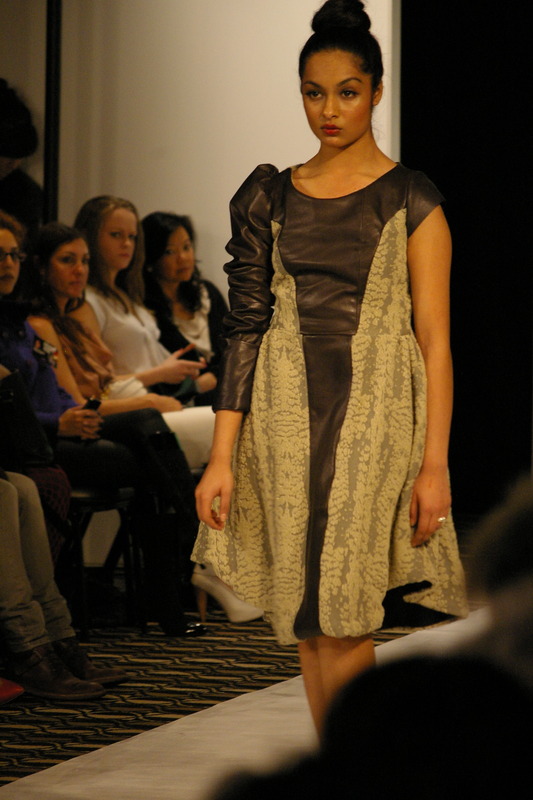 My own fashionably late post: Vancouver Fashion Week, part two. 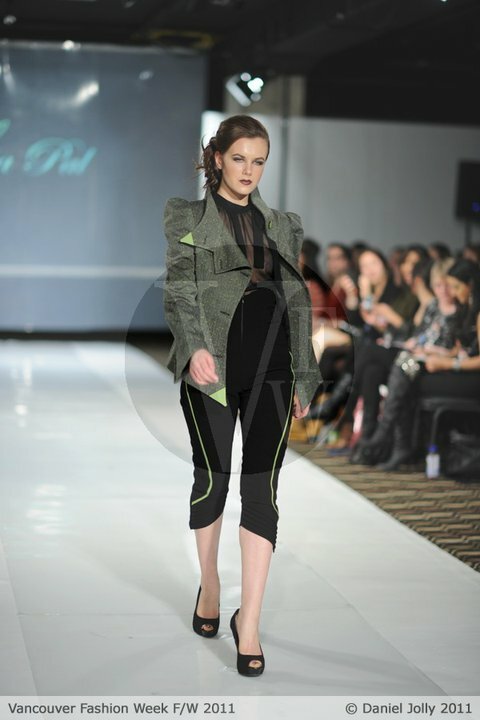 The wait, however, was worth it as Seattle-based fashion designer Liuba Palancuic’s first outfit hit the runway. A neutral palette with hints of bright yellow, green and blue comprised her collection. The pieces were mostly structured with high collars, minimal and very wearable. In contrast, the next show featuring Saskatoon designer Melissa Squire was exuberant and flirty. Models sashayed down the catwalk to big band music wearing cute, feminine party dresses. The ensembles were predominantly black but popped with coloured details such as hot pink crinolines, leopard patterns and bronze sequins. As soon as the dreamy instrumental music started to showcase Queenie Luo’s pieces, the audience knew they were in for an ethereal and delicate collection. The show consisted of gorgeous strapless cocktail dresses and formal gowns embellished with feathers, beading, bows, pleats and an abundance of tulle. They were outfits that wouldn’t seem out of place at a wedding or prom – fitting, since the Richmond-based designer is still in high school. Kind of makes me wonder what I was accomplishing at that age. 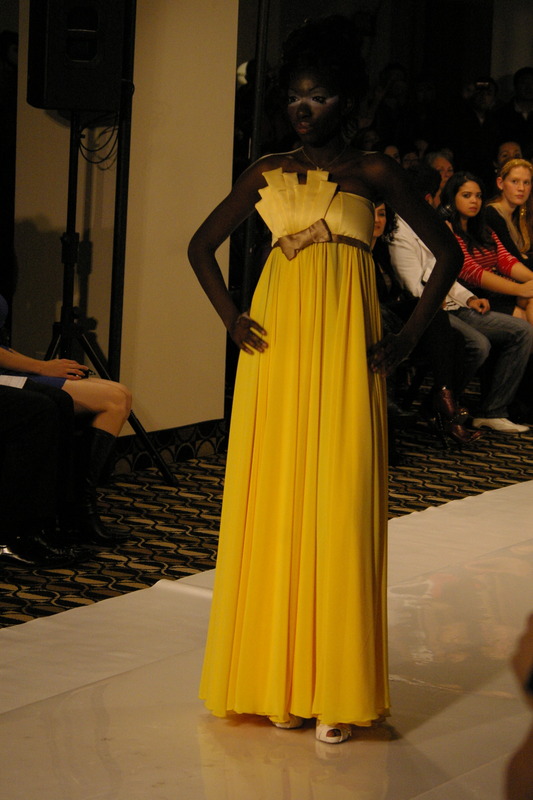 The highlights of Luo’s collection were definitely the ball gowns. One ensemble paired a full pale pink skirt and tulle draping with a big bow as the top. While most would find it totally unwearable, props to Luo for taking a risk at her first fashion show. My favourite of the collection was definitely the black and white gown with a sweetheart neckline that transformed into an all-white dress once the layer of black voile was removed. The two-styles-in-one concept reminded me of Hussein Chalayan’s spring 2007 collection, albeit a little more manual and less experimental. One thing I didn’t like about the show was the makeup. When the first model came out, I seriously thought it was a makeup malfunction. For me, it’s too reminiscent of Nicole Kidman’s face powder problem. If the next two designers’ shows are anything to go by, vibrant orange and metallics will be big for fall. Local designer Sarah Runnalls’ collection is a bit 1950s, gothic and very textured. It featured a few menswear-inspired pieces updated with feminine silhouettes, and panelled ensembles detailed with leather and fur. Her designs can be found at the Ayden Gallery. 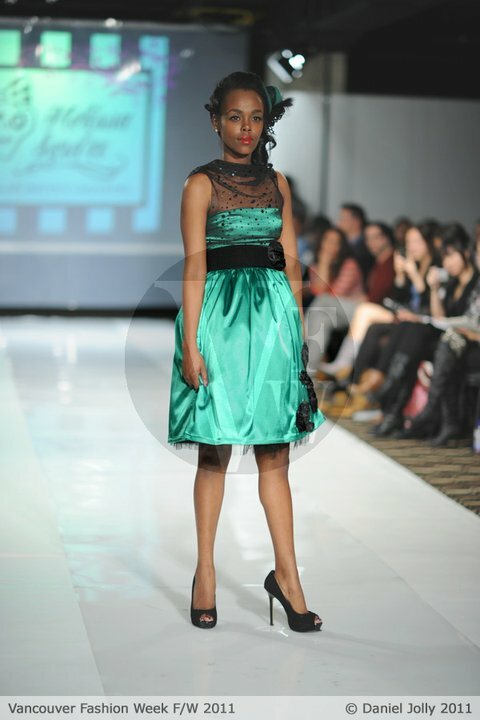 The last show I saw before I had to bounce was another local designer. Pouneh Askarian’s collection was inspired by a small Iranian tribe who create their own clothes from nature and tend to dye their fabrics in bright colours. The modern-fitted silk outfits were each accessorized with a headpiece that reminded me of Prada’s turbans made popular by Mary-Kate and Ashley Olsen. Overall, it was an interesting mix of designers at fashion week – definitely something for every style. VFW showcasing designs for spring/summer 2012 is expected to hit the city in November. All non-watermarked photos courtesy of Benjamin Yong. Click here for the full gallery.